Climate Change Impact - michael-rinderers Webseite! Climate change is expected to be one of the major challenges in the 21st century. While action to prevent climate change enforcing needs to be taken NOW, decision-makers need to know the potential impacts of climate change on water resources and flood and drought hazards. This is the fundamental basis of an active versus re-active mitigation strategy. 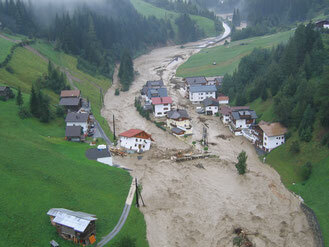 The project "HyPeCC" aims at assessing possible future flood events under consideration of realistic climate-change scenarios in alpine environments like Tyrol. To gain meaningful meteorological input-data for rainfall/runoff-modeling 'pattern scaling techniques' are applied to refine results of 4 General Circulation Model (GCMs) for the alpine area of Tyrol. The resulting mean monthly temperature and precipitation data are further processed to mimic spatial- and temporal temperature and precipitation patterns of events that have been observed in the past. The resulting input-time-series are used to perform rainfall/runoff-simulations for the tributary catchments of the river Inn in Tyrol to assess the possible future flood-hazard-potential. Due to a scarcity of land resources in mountain landscapes, natural inundation areas are often cultivated and therefore put at risk of flooding. On the other hand, technical protection measures are involved with high financial expenses. 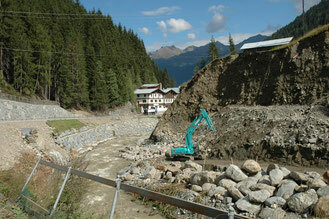 This project aims at identifying possible current and future flood vulnerability of selected municipalities in Tyrol and tries to assess the cost-efficiency of possible safety-measures. The flood-hazard potential is quantified using conceptual hydrological models for simulating streamflow generation in the headwater catchments and 2D hydraulic models to estimate the potential inundation areas. A cost-benefit-analysis is then performed to contrast the potential flood losses with the costs of necessary safety-measures. The outcome of this project will inform political decisions on how remaining land resources are protected and public financial resources are infested in order to optimize losses due to potential future flood events.